Murder in the Synagogue | Rabbi Lawrence A. Hoffman, Ph.D.
With all due respect, and (as they say), l’havdil (quite the opposite) — I do not mean to equate the two – synagogue success is like plotting a murder. You need means, motive, and opportunity. By means, I mean the individual components that go into a successful undertaking. They are the easiest of the three to arrange, because unlike motive and opportunity, they are more readily attainable, one by one. The most important is open-minded, eager, and even urgent rabbinic leadership. When it comes to synagogue transformation, rabbis cannot do it alone, but they can kill it all by themselves – and not through malice aforethought. All they have to do is refuse it their full support; laypeople (who have jobs to go back to) will tire of the effort; the job to which rabbis return is precisely the place where they can kill it from. 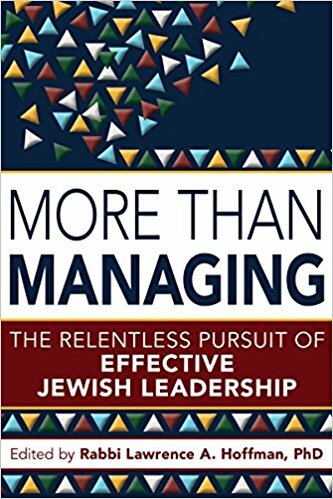 Synagogues deserve rabbis who demand excellence beyond mediocrity; who cannot abide the idea of spending an entire lifetime doing endlessly and repetitively just what they’ve always done; and who take time to deepen themselves intellectually and spiritually, so that can deepen their synagogues similarly. Such rabbis exercise soft charisma – not the bravado of a great figure striding through the synagogue, filling it with magniloquence, but the ability to listen, to understand, and to engage congregants profoundly with ideas that matter. The second component is lay leadership that enables rabbis to operate at their best. Synagogues need to set priorities that do not condemn rabbis to endless committee meetings at the expense of leadership and visioning. They need to value the rabbis’ need to study, read, and think. Then too there are most board meetings where discussions are often predictable, redundant, and tiring. Board meetings should send their members home empowered, not defeated; energized, not enervated. Boards routinely handle fiduciary and governance issues (as they should); they rarely set aside important time for generative conversation – matters of mission, substance, direction, and the philosophy behind whatever the synagogue is doing. Other “means” include a unified professional team and an efficient support network; but also financial sustainability and a physical space that furthers the spiritual well-being of the synagogue mission. These may not be in place when synagogue transformation begins; proper transformation determines their necessity and brings them into being, after which, they become the further “means” to take the next transformative step. Motive is harder to attain than means. Every synagogue is motivated to do something, but that “something” is usually of limited scope — purely fiduciary (balance the budget) or a matter of governance (set up a committee). Only motives that flow from generative conversation can excite to the point of claiming loyalty beyond the crisis of the moment. Motives for Jewish community were once handed to us as unquestioned givens. What further motivation did we need when anti-Semitism was rampant; when belonging to a synagogue was just the thing to do (Jewish civic virtue, if you will); or when Judaism was an ethnic thing — a matter simply of “hanging” together over bagels, while feeling good about each other? But we now live in a post-ethnic era. Half our congregants will be (or already are) people not born Jewish and requiring a reason to be synagogued. We now inhabit an Era of Anxious Identity, where we struggle to decide what the various parts of us are. If you are reading this, you may be an American, a New Yorker, a woman, a wife, a mother, a professional, a tennis enthusiast, a musician – and a Jew. But how much of you is the Jewish part? Enough to matter? To be decisive? A synagogue today – indeed, religion, generally – competes for the discretionary part of our everyday loyalties. Not just our income, but our time and attention go first to those parts of who we are that we consider central: our families, then our jobs (perhaps), and then? What comes next for my hypothetical reader’s struggle to determine her identity? Tennis? She is an athlete. The concert? She is a musician. Planning a vacation? She deserves it. Or, maybe, the synagogue and the Jewish project? She is Jewish! The Jewish project of the centuries: nothing less is at stake. Synagogues must offer a transcendent motive, without which, they exist for purely utilitarian ends, lumbering on with nothing profound to offer. Great synagogues know the point it all, and express that point unreservedly in everything they say and do. Their members know they matter. The master synagogue (like the master criminal) puts it all together: the carefully constructed set of necessary means, driven by a motive so compelling that it becomes practically an obsession – a healthy obsession, in our case, the compelling need to make a better world, enhance one’s life with significance, further the Jewish project, and shape a destiny in league with God. Contrary to popular opinion, however, opportunities rarely knock. They must be sought out. So opportunity refers to the way a synagogue assembles its means (rabbi, professional staff, board, etc.) into a smoothly functioning system that can manufacture opportunity even when none seems evident. For this task, synagogues need culture and system. First and foremost, is synagogue culture. Many synagogues manifest a culture of conflict, stress, suspicion, blame and emergency. Their clergy and lay leaders work well together only when the chips are down, but otherwise take no risks for fear of failure. They are wary of sharing aspirations, doubts, and new ideas. Others have cultures of mediocrity: nothing altogether new gets said or done; the loyalists who show up anyway love each other no matter what the synagogue does. No one challenges anyone to do more. Great synagogues promote cultures of honesty, nobility and trust; of expectation and appreciation. Its members share a single compelling motive – a vision that is too important to languish. To attain such a culture, synagogues need system — the way its individual parts (the means) communicate and work together. Time is spent building relationships. Expectations are shared with mutuality of support and certainty of vision. Means, motive and opportunity: These are integral to great synagogues in the making. An aside: Nothing to do with your interesting article, frighteningly aligned in memory: when I was in Yonkers there was a murder in the Synagogue at an outside rental event. I would not let any prayer continue in the building until we had a full hanukat habayit, which we did prior to the next shabbos. Made the “Jewish News” 2 page spread with Davis in a grandpappy tallis and hanukiyah. Keep up the good work at TE-E.